Wide-eyed and innocent, women, children and animals crowd their ochre canvas, their gazes all fixed on the viewer, affronting and accusing the war-torn world outside. Painted in 1951, Women, Children, Animals is a vibrant yet haunting image of life dating from the zenith of Karel Appel's involvement with the CoBrA movement. The innocence of the pastoral idyll he has depicted, and the implied innocence of the style in which Appel has rendered it, acts as a foil to the modern world, a plimsoll line against which we measure our fall from grace. Appel had only moved to Paris, essentially the centre of CoBrA activities, in 1950 but his move had an immediate and beneficial effect on his work. Although completely unrecognised in France except by his circle of Northern European contemporaries his art immediately flourished there. Two years earlier, in 1949, he had been commissioned to create a mural to decorate a wall in Amsterdam's City Hall. The result, Vragende kinderen ('Inquiring Children'), was covered up almost immediately in a storm of public and media protest. Paris provided some solace for the embattled artist. He was almost anonymous in the French capital, yet his increased isolation in fact forced him to focus more on his art. Speaking no French, painting became his main source of expression and release. While his earlier works, including the scandalous Vragende kinderen, had a raw element to them, they nonetheless tended to be composed and controlled. However, on his arrival in Paris his brushwork, and indeed his whole act of creation, became more spontaneous and physical. Although the palette and the wide faces in Women, Children, Animals retain obvious similarities with Vragende kinderen, Appel's application of the paint is already far more free. There is an element of chance in Women, Children, Animals, for instance in the drips, which is lacking in its predecessor, while the more ordered layout of the fields of colour in his 1949 work has been largely abandoned. Appel had at long last truly tapped into an unrestrained and intoxicating vision and art. 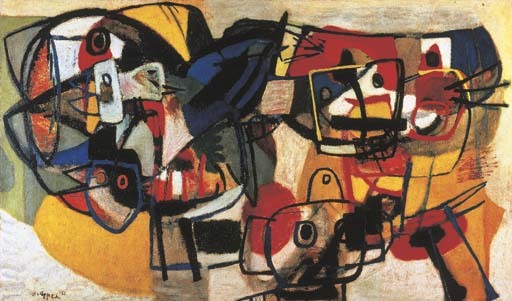 Although Appel had sought a childlike view of the world in his earlier work, it was only on his return to Paris in 1950 that he was truly released from the burden of all his artistic teachings. This was in part due to the similar mindsets and aims of various contemporaries in France who had already set an anti-style precedent, not least the master of Art Brut, Jean Dubuffet. Referring to his CoBrA colleagues, Appel himself said that 'Dubuffet gave us the stimulus to break away, to conquer a new expression, a new dimension, a new space' (Appel, quoted in E. de Wilde, 'Edy de Wilde in conversation with Karel Appel', pp.12-15, Appel, exh.cat., Osaka, 1989, p. 12). However the aims of Dubuffet were very different from those of Appel; Dubuffet's anticultural art was based more on psychotic art than that of children, although he admired both as they were both untrained, untainted by teaching, styles and disciplines. This raw element appealed to Appel as well, but his interest in children as subject matter and their art as a medium was deliberate and politicized. Appel sought to capture not only the fresh and subjective vision of the child in his work, but also to tap into a certain innocence that was, to Appel, a necessary balm in a world so drastically scarred by the turmoil of the Second World War. Appel used the wide-eyed faces of the children to invoke an element of accusation of the generations involved in the various tumults of the modern era, hence the furor surrounding Vragende kinderen. When it had been unveiled, Appel had said of his inspiration that at the end of the Second World War, 'I saw German children begging along the whole length of the train. At the time I did not realise that I had been marked to that extent, but the result is there' (Quoted in, Karel Appel: Peinture 1937-1957, Paris, 1988, p. 302). Women, Children, Animals appears haunted by that same image. In many ways, the war and its aftermath remained at the core of Appel's work for many years. His experiences as a labourer on various farms in Holland during the Occupation, and his hand-to-mouth existence both then and later marked his work. Both his life in the countryside and in the city combined to create his unique artistic vocabulary. The animals in Women, Children, Animals are reminders of the transient lifestyle he had adopted, of the solace and shelter that he often found in the countryside and farms, while much of the style is in fact derived from his experiences living on the street. Some of his work took the form of collages, assemblages of scraps and found materials, the rubble, chaos and destruction of his nation condensed into relief form. This even extended to his paintings on canvas--the shocking red that appears in several parts of Women, Children, Animals was inspired by a red scrap of plastic that Appel had found. In Holland, plastics had still been rare, and this scrap acted as an epiphany for him. It resembles spilt blood, and yet is a lively and vibrant color, adding zest and movement to the picture. The ambiguity of this red cuts to the heart of Appel's own conviction that 'Art is a tangible, sensual experiencing, intensely moved by joy and the tragedy of man' (Appel (1950), quoted in Karel Appel, A. Frankenstein, ed., New York, 1980, p. 49).